Before moving out to Utah in 2018, I flew out to Salt Lake to visit my buddy Luke. The weekend was full-throttle from the moment I landed. You can see the full weekend’s shenanigans here. But I wanted to talk about this photo. See, it was my first time ever seeing a desert. We drove the 2hrs from Salt Lake to the Little Sahara Recreation area to climb Sand Mountain. Usually, a hotspot for OHV users, we were planning to head up by foot instead. And if you’ve ever gone for a walk at the beach, you know how tiring the sand can get. Now imagine hiking a 1,000 feet up on a steep, sand covered mountain. It was tough, but all too hilarious at the same time. 2 steps up, one step slid back. The sand was getting everywhere. In our eyes, ears, and especially my camera. But once we eventually made our way up to the summit, it became totally worth it. At that moment, I realized, I’ve never been that far from anything. 360-degree views of nothing but mountains, desert, and abandoned ghost towns. We were really out there. And thats when I turned towards the west to capture this photo. The light coming from the south, casted shadows on all their northerly aspect dunes, adding more and more contrast to the frame. 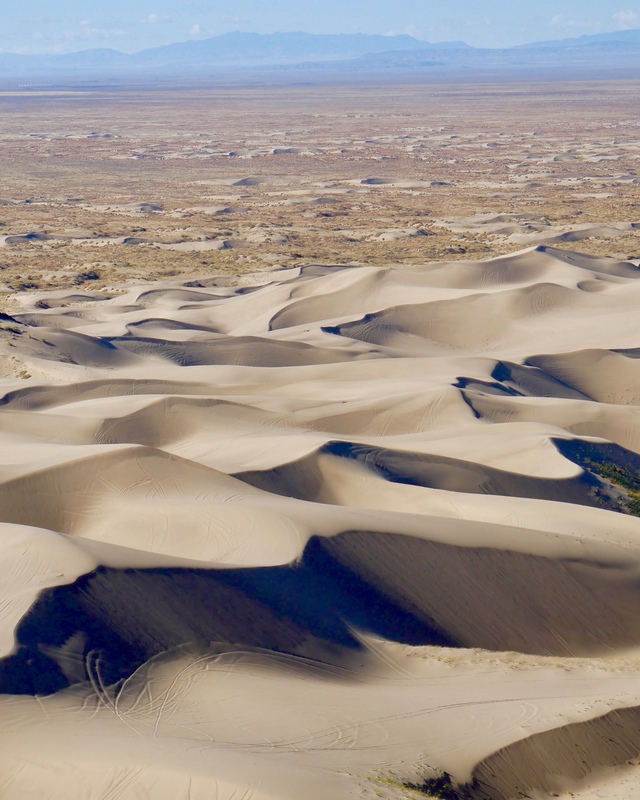 The dunes eventually faded off towards the west, where they met the next mountain range across the valley floor. It was such a beautiful image, to me, as this wild bit of nature is also a gigantic playground. And this was characterized in the foreground with the tire marks on the wall of the dune. This place, far from anything and everything, attracts people to come from all over to play within it. I bumped up my shutter speed to account for the bright, sunny day, and closed my aperture down to 10 so that I could bring the whole frame into focus. Yet, the composing the dunes in the foreground as the focal point with the sharpness. Then allowing it to fade off in the distance as it drops to the valley floor and into the mountains in the distance. This was shot handheld. The rest of the day was spent sprinting down the hill, jumping and flipping into the sand. Exhausting ourselves to the absolute limit. And finishing it off with our second visit to Red Iguana of the weekend.